On the 22nd June, the IRA attempted to assassinate King George V of England at the first opening of the northern parliament in Belfast, the opening that formally denoted the beginning of partition. This operation isn’t particularly well known, but was related by some participants to their children decades later. It’s not clear if the assassination attempt was an official operation, though. Certainly it’s not openly listed among the Belfast Brigade operations when they were documented during the 1930s. The plan for the attempt appears to have involved members of C Company, 1st Battalion (from Carrickhill) and D Company, 2nd Battalion (from North Queen Street). The high level of security around King George V and the parliament opening meant the IRA unit didn’t get close enough to carry through the operation. Newspaper reports, such as in the Freeman’s Journal claim there were 11,000 troops and policemen on duty for the King’s visit, along with 300 Scotland Yard detectives (the Irish Independent noted the fear that something untoward would happen). The visit itself only lasted for four hours and thirty-five minutes. The landing stage, at Donegall Quay, was guarded by detachments of cavalry and infantry, both with fixed bayonets. Between the quay, on the fifteen minute journey along High Street, Castle Place and Donegall Square, a crowd of 20,000 loyalists eagerly cheered the Kings arrival to City Hall where the northern parliament was to sit. Outside, rows of troops with fixed bayonets controlled access and, inside, the Irish Guards provided security. After lunch in the City Hall, the King travelled across to the Ulster Hall to deliver a second speech, again amid high security. The whole party returned by the same route to the quays for departure at 4.05 pm, having arrived at 11.30 am. The plan may have been to try and get close to the King disguised as RIC men. During an RUC search of the yard behind a shop on the New Lodge Road in 1923, a barrel containing a small arms dump was found. 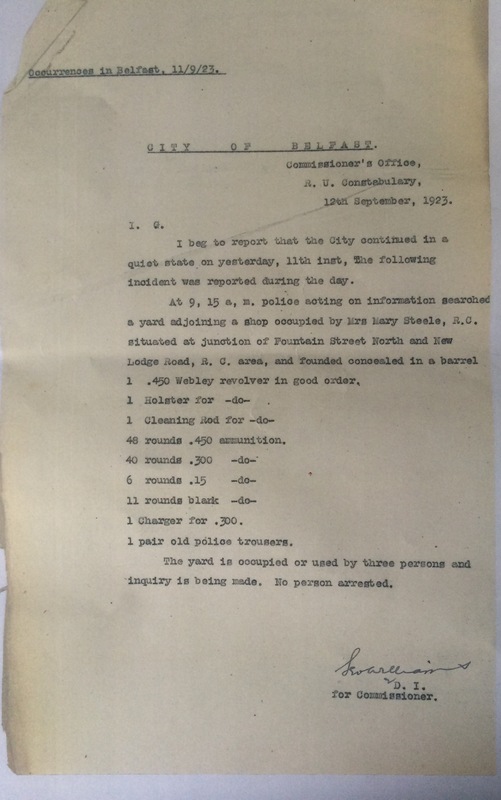 It held a Webley revolver and over 100 rounds of assorted ammunition, cleaning rods and other items (see RUC record of the search below). It also included a pair of policeman’s trousers. The dump belonged to Bill Steele, who was part of the unit that was to assassinate King George V. As Steele wasn’t there, the RUC arrested two of his brothers instead. Neither was charged with the possession of the dump and both were set free within three weeks. Conversant with Chairman Mao? The speech that split the IRA, July 1969. Almost all those involved in the IRA in 1969 cite a speech given by Jimmy Steele in Ballyglass cemetery in July that year as a pivotal moment en route to the splits that occurred, firstly between Belfast and Dublin that September and, then, across the IRA as a whole. The content of the speech, delivered at the re-burial of two IRA volunteers executed in England in 1940, was reported in Peter Taylor’s book Provos in 1998. But the published text doesn’t match the surviving audio of the speech, now held by the Irish Republican Museum in Conway Mill. The differences are significant and give some fresh insight into those at the centre of the IRA split. Steele’s speech is largely credited with galvanising the group which challenged Cathal Goulding’s leadership of the IRA and who ultimately formed a provisional Army Council, having dismissed Goulding’s as unconstitutional. The official, published, account of the Barnes McCormick re-burial in the republican newspaper, The United Irishman (which was under the control of Cathal Goulding’s supporters), omits any reference to Steele’s speech. Similarly, the mainstream press coverage of the event makes no reference to the content of Steele’s speech other than questioning use of the word ‘glorious’ referring to republicans in the 1940s. Neither is there a published text of the speech from Steele himself. By 1969, the Belfast IRA no longer published its own newspaper. Tírghrá, which had been published in the early and mid-1960s and edited by Steele, was no longer printed in 1969. Taylor cites his source as a tape recording of the speech played for him by Billy McKee. The recording was made by Leo Martin who donated it to the Republican History Museum in Conway Mill in Belfast before his death (Martin had also given McKee a copy, some time before 1998). The surviving recording includes two speeches, one by Jim O’Regan, followed by instructions being given from the platform for the colour party and laying wreaths, then, Jimmy Steele’s speech. While the weather was dreadful on the day of the re-burial, the audio quality is still remarkably good. The very start of Steele’s speech is missing and either the tape or the 1969 amplification system fades out at one point (but the start of the missing word, ‘republic’, and the context are clear). There are a number of printed versions of an extract of the speech, all seemingly lifted directly from Taylor (e.g. in Patrick Ryan’s The Birth of the Provisionals, Robert White’s biography of Ruairí Ó Brádaigh, and, Sean Swan’s Official Irish Republicanism 1962-72). Almost all are used for analysis of the ideological basis of the IRA split and to illustrate a picture of Steele and those that rallied around him as right-wing militarists, staunchly opposed to a ‘leftward’ drift of the IRA under Goulding. But oddly, the quote published by Taylor, and it’s annotation, do not correspond to the surviving audio in the Irish Republican Museum. A period that cost the lives of twenty-six soldiers of the Irish Republican Army, nine by execution in England, Belfast and the Twenty-Six Counties, five in gun battles with enemy forces and the remainder on hunger-strike or in the prisons. Yet, until recently, there seems to be this deliberate blackout of that glorious period. Could it be that it is so fashionable to be tinged a deep red, to be militantly anti-British in the Forties, as Barnes and McCormick and their comrades were, is now considered to be tantamount to being dubbed fascists. These men were not fascists, nor Communists, nor murderers as their enemies allege them to be. They were simply guilty of the unpardonable crime of being Irish patriots, imbued with a deep love of Ireland and her cause of freedom. Today, in many places, pure and raw patriotism is frowned upon. As is adherence to the policy of non-compromise and force. Indeed, one is now expected to be more conversant with the teachings of Chairman Mao than with those of our dead patriots. Barnes and McCormick were not intellectuals, they were just ordinary working class lads who looked upon it as their duty to right Ireland’s wrong. Despite the dramatic flourish included by Taylor (and quoted by most of those who use Taylor’s account), there is no interruption of the speech after the reference to Chairman Mao and none of the cries of ‘hear, hear’ that are reported in Taylor’s account. There is also a lengthy section of the speech after this segment and before the last portion, as quoted by Taylor. From the graves of patriot men and women spring living nations, said Pearse. My real hope, is from these graves of Barnes and McCormick, will emanate a combination of the old and new spirit, a spirit that will inspire men and women with the noble idealism of Pearse, the social and economic philosophy and aims of Connolly, and the fighting and courageous heart of Cathal Brugha. A spirit that will ensure the final completion of the task which our martyrs were compelled to leave unfinished. That is how Barnes and McCormick can best be honoured. That is how they would wish to be honoured because that is why they lie in martyrs grave today. Rather than the cartoonish invective against ‘communism’ that it has been represented as, Steele’s speech critiqued the consequences of strategic decisions taken by the IRA at various junctures. Repeatedly Steele returns to Connolly, deconstructing the Goulding leadership and accusing it of having been infiltrated by individuals wishing to dominate, re-direct, then use the republican movement as a platform for their own agenda. In some respects, the speech given by Steele sought to wrestle Connolly back from Goulding and his supporters to de-legitimise Goulding’s strategy. The key point, in bold below, cut deeply enough for Goulding to have Steele immediately ejected from the IRA without even a court martial (despite Steele having seen continuous service since 1920, and, contrary to IRA rules). The barb found it’s target so quickly that Matt Treacy (in The IRA 1956-69: rethinking the Republic) reports that Séan Dunne, one of the colour party drawn from Goulding’s supporters in the Dublin Brigade, wondered melodramatically if he should shoot Steele on the spot. Oddly, all the subsequent analysis of Steele’s speech appears to be based on the extracts reported by Taylor, which don’t really appear to accurately reflect the speech delivered by Steele. Rather than the quote used by Taylor, the most significant part of Steele’s speech is below. The main point that the whole speech builds up to is highlighted in bold. A great deal of propaganda is still being made on the question of unity among all who claim to be working for cause of unity and independence of our country. And Connolly’s words on this matter should give us all food for thought when he said, “Unity is a word used by many with ulterior motives, to achieve political ambition, or ultimately, to seek power and control in a united movement.” Therefore in striving for genuine unity we must be careful that such efforts may not lead to that seizure of power and control by the wrong people as defined by Connolly. Unity was a word used as a means of propagating acceptance of the Treaty of 1921. It was also used by Fianna Fáil as a means of gaining power and control in 1932. To become participants in this unity drive, republicans were urged to vote Fianna Fáil into power in Leinster House. They were expected to compromise just a little as a means to an end. To tolerate for the time being, political leaders and organisations who had already deserted or betrayed the republic. Thanks to Johnny, Susan and Patsy from the Irish Republican Museum in Conway Mill for help in accessing the audio. You can hear some of the audio here. Article entitled ‘Flag waving at Stormont’. from Belfast Sinn Féin newspaper, Resurgent Ulster, June 1954. Resurgent Ulster was published in the 1950s and edited by Jimmy Steele. When banned by the northern government it was published first as Uladh ag Áiséirghí then Glór Uladh. Publication ceased with the start of the 1956 campaign when it was finally suppressed.